Samford University honored outstanding student leaders at the school’s 2015 leadership and service convocation Thursday, May 7. Bailey Fuqua and Adam Quinn were named co-winners of the James M. Sizemore Award as the students in the senior class who best demonstrate character, personality, scholarship and unselfish service to Samford. Fuqua was cited as being an example of the award’s criteria as well as for her excellence both inside and outside the classroom. The journalism and mass communication major from Franklin, Tennessee, was also named co-winner of the Rufus W. Shelton Community Service Award as the female student who has done the most for betterment of life at Samford. A University Fellow, she is a member of Alpha Delta Pi sorority, Omicron Delta Kappa leadership honor society and the Student Government Association, which she serves as press secretary. Quinn was commended for his efforts to include a range of perspectives from across campus in his role as opinion editor of the Crimson student newspaper and for his off-campus initiatives with Impact Alabama’s College First program and NorthStar Ministries. A University Fellow and recipient of a Fulbright U.S. Student Award, the English major from Decatur, Alabama, will pursue a master’s degree in Anglo-Irish Literature at University College Dublin. Cody Russell received the John R. Mott Award as the man in the graduating class who best represents high character, scholarship and student public service. The sports medicine major from Brentwood, Tennessee, who plans to attend medical school, has volunteered with Birmingham’s M-Power Ministries and has served abroad in Haiti. He is president of Alpha Epsilon Delta national pre-health honor society, a Connections leader and a member of the varsity track and field team. Kendall McPheeters received the Gail Hyle Memorial Award as the woman in the graduating class who best exemplifies Christian character, leadership, school spirit and service. She was cited particularly for leadership of her sorority and Panhellenic Council on campus and her missions work in Uganda and Haiti. The senior biology major from Huntsville, Alabama, played a key role in developing Samford’s MD Calling program, which she will serve as a staff member this summer. David Osula was named co-winner of the Rufus W. Shelton Community Service Award as the male student who has done the most for betterment of life at Samford. A founding member of the Student Liaisons program, he has worked to connect student volunteers with Habitat for Humanity for three years. He is a member of Alpha Lambda Delta honor society, Pi Kappa Phi fraternity, Omicron Delta Kappa leadership honor society and other campus groups. Osula is a senior biochemistry major from Jasper, Alabama. 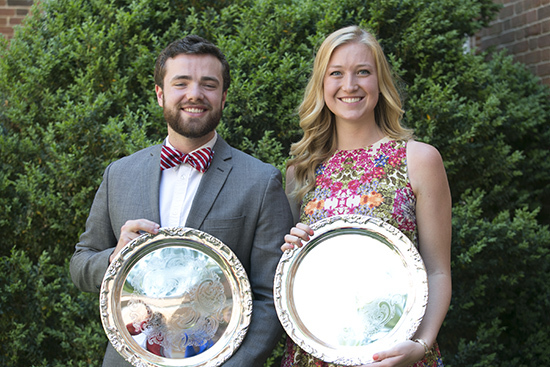 Annie Smith and Joshua Washington received Luke 2:52 awards, given annually to two undergraduate students who excel in all areas of student life: civic, social, spiritual and physical. Smith is a sophomore biology major from Columbia, Tennessee. Washington is a sophomore sports medicine/pre-medicine major from Meridianville, Alabama. John Hunsicker received the Omicron Delta Kappa Circle Leader of the Year Award for exemplary service to the circle and to the Samford community. The senior biology major from St. Louis, Missouri, has served as Circle president this year. Bailey Bridgeman and Austin Chapman received Omicron Delta Kappa freshman leadership awards as the female and male students who showed exemplary character, leadership, service and scholarship during their first year at Samford. Bridgeman is a pre-medicine major from Colleyville, Texas. Chapman is a biology major from Birmingham. Many other students were applauded for leadership in a variety of academic, service and student government posts. Jeanna Westmoreland, wife of Samford president Andrew Westmoreland and a longtime leader in education, was guest speaker for the leadership and service convocation. She urged students to reflect on service and leadership by considering aspects of change, challenge and charge. Westmoreland said that she learned about God’s call to service from her pastor father and school teacher mother, who taught her valuable lessons in compassion, perseverance and service. “We are called to serve Him through using our gifts,” Westmoreland said. In Genesis, she noted, scripture tells how Abraham responded to change and an unknown future with faith and obedience. Her own early years, she said, saw many changes in schools and towns. Then, after marriage and life in the same Arkansas town for 27 years, she give up a career as a university dean of education and chair of the Arkansas Board of Education when her husband was named president of Samford eight years ago. “These changes forced me to reflect on God’s purpose for my life,” said Westmoreland, who teaches at Samford and is executive director of the Samford Legacy League in addition to serving in many other leadership roles. “We should recognize that leadership and service are rooted in serving and meeting the needs of others. Seek opportunities to use the gifts that God has given you,” she advised the students. Challenges and adversity in the form of conflict, unexpected problems and disappointments can derail potential for leadership, she said. But scripture says to find joy in the challenges, she said. “I’ve learned the most when I’ve stretched beyond what I thought I could handle,” said Westmoreland, recalling the tragic tornadoes of 2004 that have taken years for the people of Arkansas to overcome. But all challenges are not that large. “Every day, we see many small challenges that have an impact on our character,” she said. “Our gracious God gives us the opportunity to start new and fresh each day,” she said, advising the students to examine their deeds and focus on doing them for God rather than for the sake of perfection.